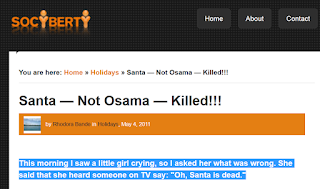 Warayblogger.com: It was Santa, Not Osama! It was Santa, Not Osama! This morning I saw a little girl crying, so I asked her what was wrong. She said that she heard someone on TV say: "Oh, Santa is dead." I stood there quite perplexed — why would anyone on TV say Santa is dead? Then the proverbial light bulb above my head lit up. 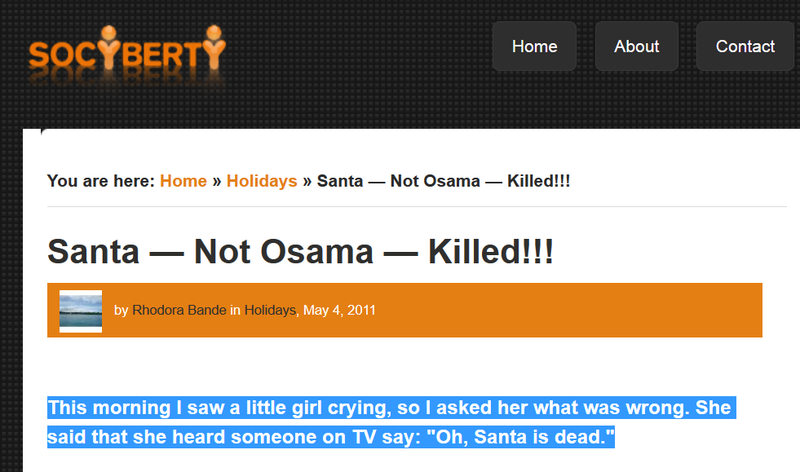 She had heard someone say "Osama is dead", not Oh Santa is dead. I tried to reassure the child that they were talking about someone else, not Santa, but she was not convinced. "He had the hat and beard — it was Santa!!! ", she said most emphatically, and I began to wonder. Sure, the colors are different: gray-bearded Santa versus dark-bearded Osama, but maybe this little girl was on to something. Let's look at the facts, shall we? Where does Santa live? That's easy — the North Pole, but has anyone ever seen or photographed Santa's place? No. Where might Santa be then? Who's to say that he wasn't hiding in a compound in Pakistan? Perhaps that's where he really lives and has his workshop. Who would suspect that? After all, Pakistanis don't even believe in Santa, do they? What a perfect place to hide. Sure, he had to give himself a different look so people wouldn't recognize him — change hats, dye the beard, cultivate that "I'm a homeless guy" image. Maybe Santa's not even really fat? OK, overweight — let's be kind. Maybe it's all padding that he takes off when he's done with the once-a-year Santa gig. Think of how devious al-Qaida must’ve been to come up with this plan — tricking US special forces into whacking the Claus, but you know, this kind of makes sense. They swoop in with helicopters, kill who they think is Osama, then get hit with the ugly truth. “Oh my God, we really screwed up! We just killed Santa Claus!” Well, they certainly can’t leave Santa’s body lying around, so off it goes into one of the choppers. Maybe the other chopper wasn’t even really blown up, but hit a flying reindeer and crashed. Where to dump the body so no one will find it? Why, the ocean of course. If you look closely at the news reports coming out of Pakistan, you can see crying elves (no, I said elves, not Elvis – this article deals with facts, not fiction) in the background, wandering around aimlessly – asking for handouts now that they are unemployed. I think there was even a shot of an empty sleigh. What does this mean for us? Well, maybe that little girl was right, and maybe she wasn’t. We’ll just have to wait till Christmas time to find out the truth, won’t we?